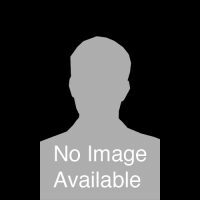 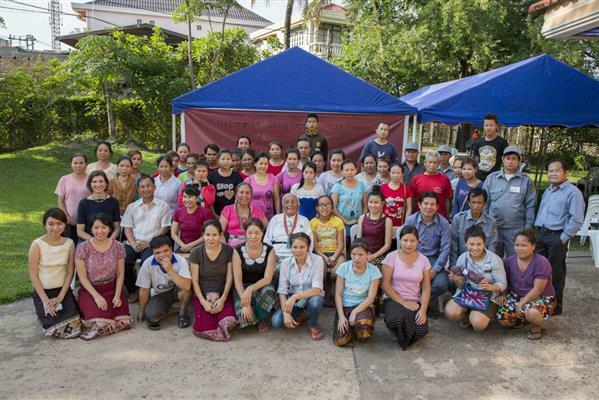 My clan is Hooghanlani, and my father’s clan is Nakai Dine. 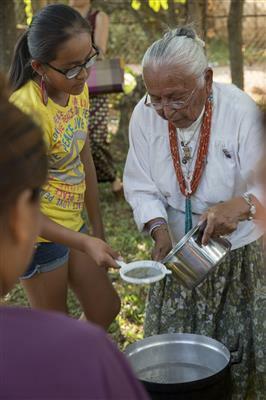 My grandfather’s clan is Ta’ neeszahnii and my Nali’s clan is Hozae Tachii”nii. 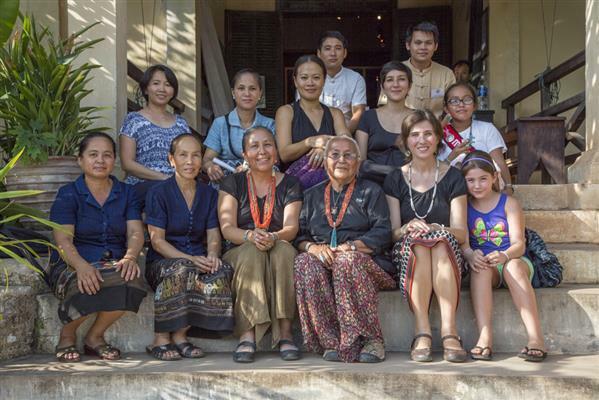 My clan is Hooghanlani, and my father’s clan is Nakai Dine. 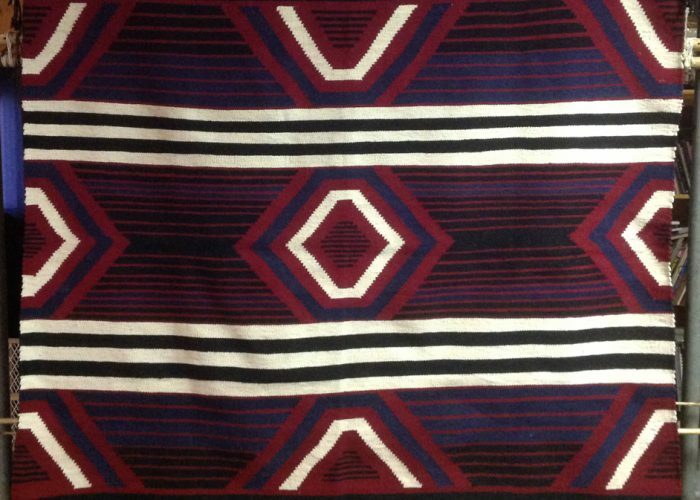 My grandfather’s clan is Ta’ neeszahnii and my Nali’s clan is Hozae Tachii”nii. 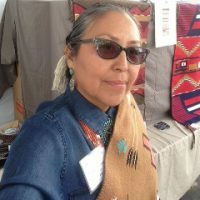 I was raised in Littlewater and Table Mesa, New Mexico, U.S.A. 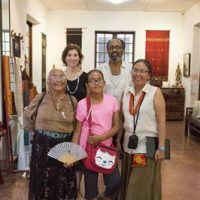 I grew up with my four sisters and three brothers. 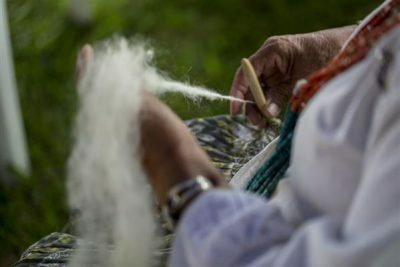 At that time, sheepherding was our main life every day. 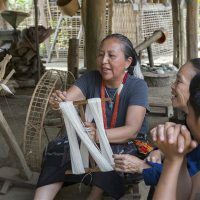 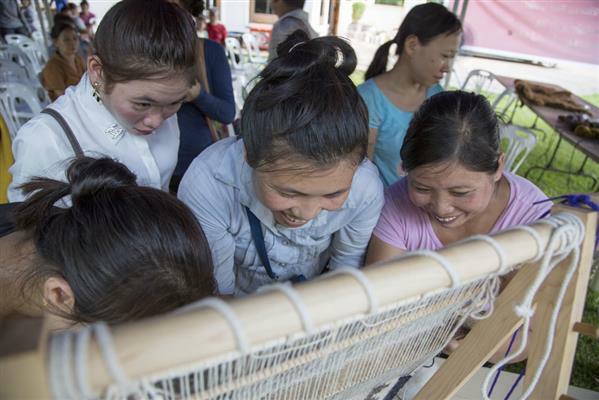 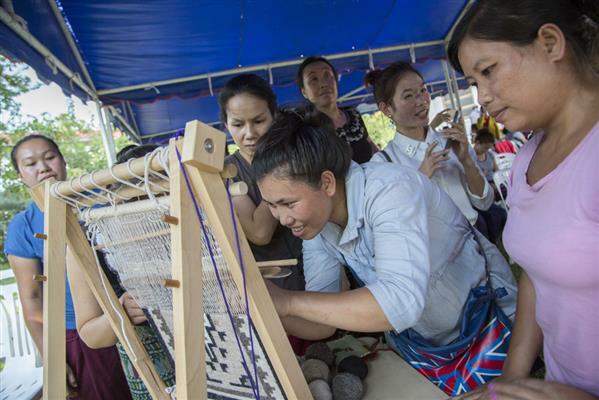 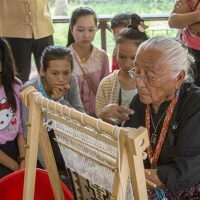 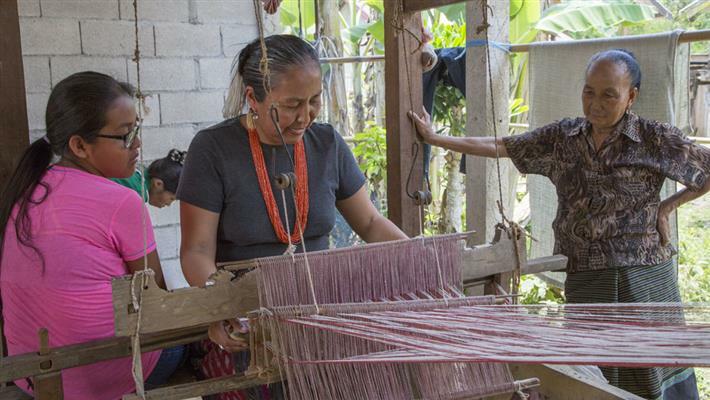 Both Laos and the United States have strong weaving traditions that date back thousands of years. 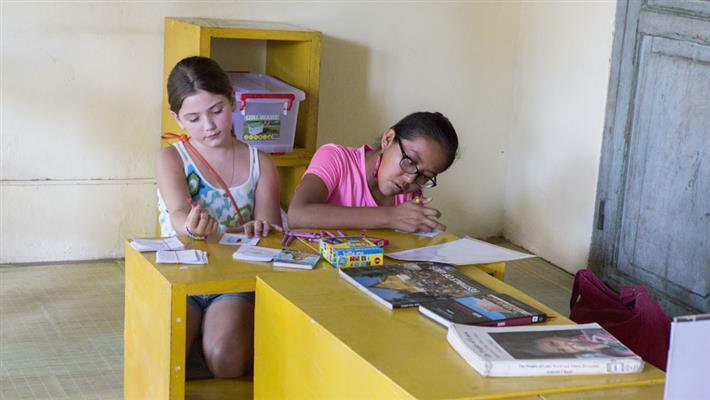 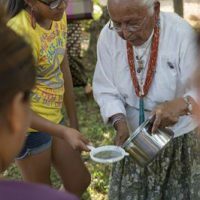 In the United States, one of the strongest traditions belongs to the Navajo people, the largest Native American tribe in the United States. 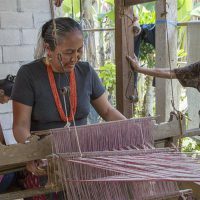 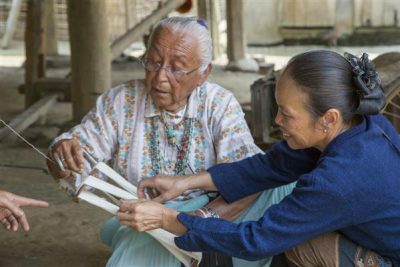 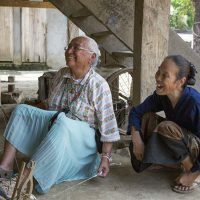 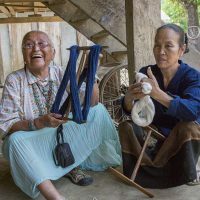 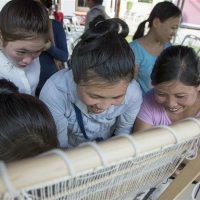 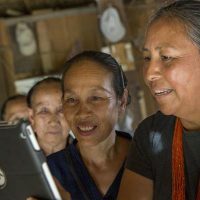 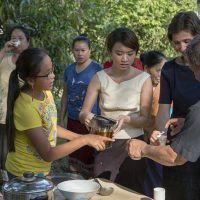 In the Lao People’s Democratic Republic, the weaving traditions have been part of the daily lives of many of the Laotian ethnic groups, both for daily and ceremonial use. 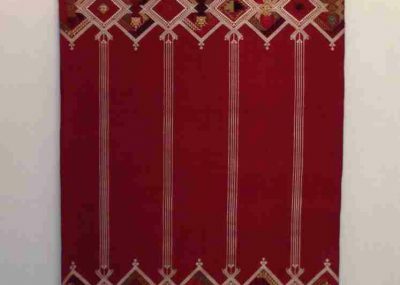 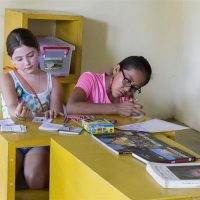 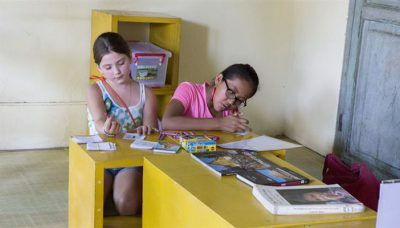 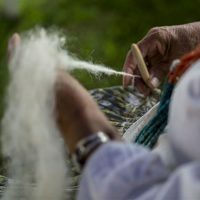 Where as the Navajo weavings are created of wool, from sheep raised on premises, and the Laotian weavings are either made of silk or cotton, both weaving traditions show surprising similarities in design and technique. 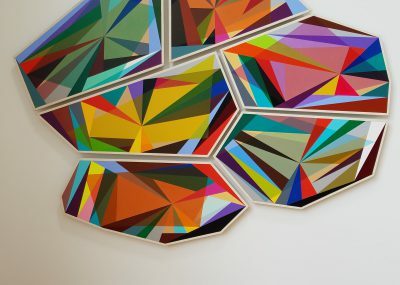 The idea of finding commonalities and appreciating differences was the concept behind the Art in Embassies exhibition at U.S. 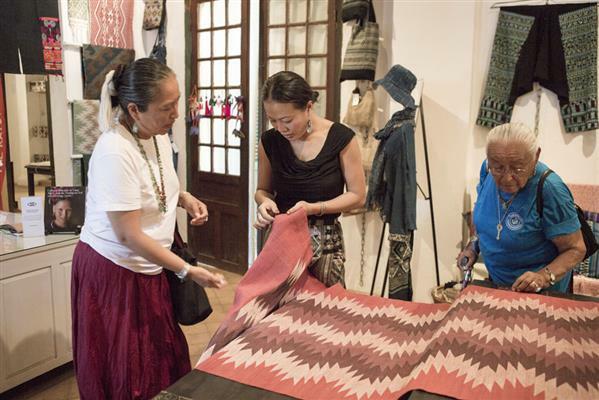 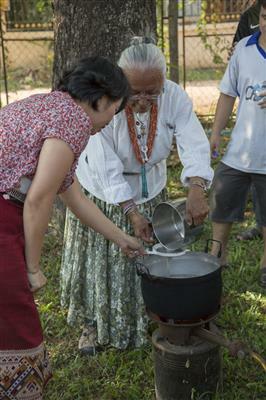 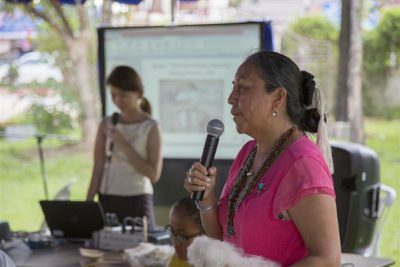 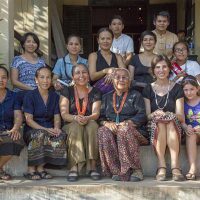 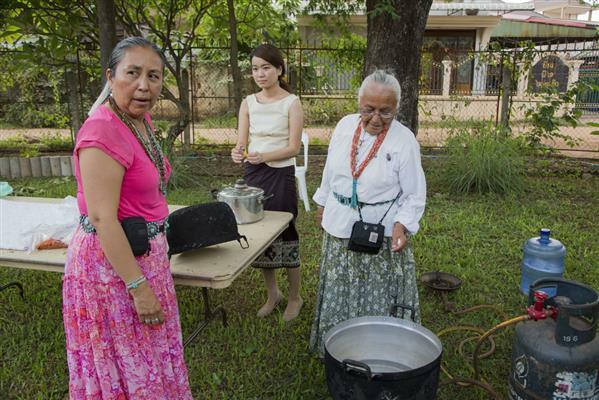 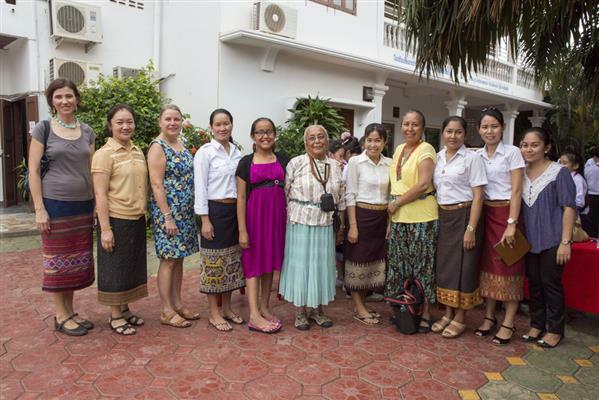 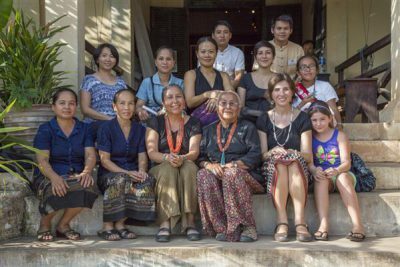 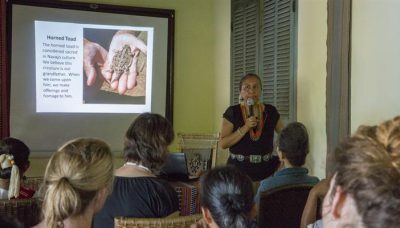 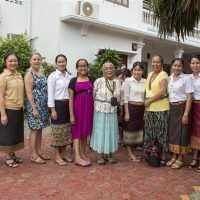 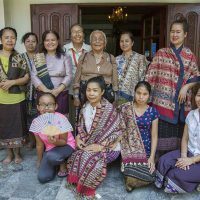 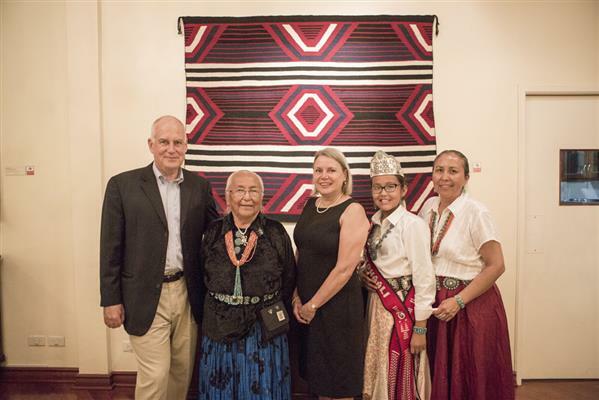 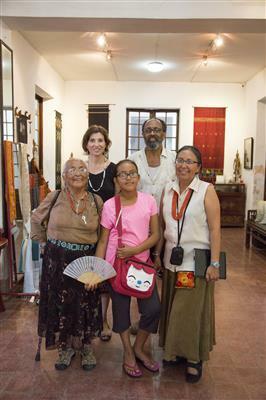 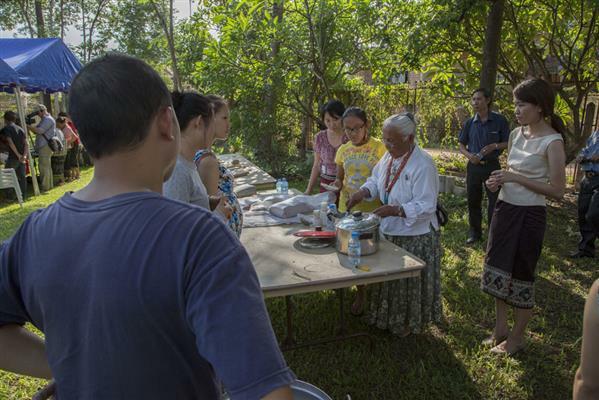 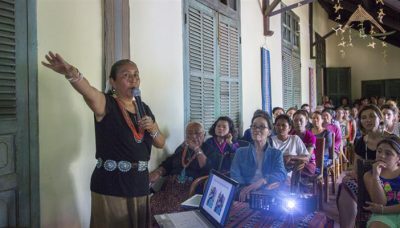 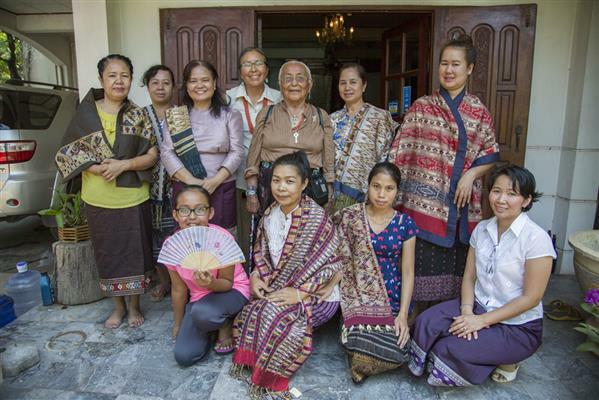 Ambassador Clune’s residence in Vientiane and helped inspire the Artist Exchange with three generations of Navajo weavers: Ms. Sarah Nataani, Ms. TahNibaa Naataani, and Ms. Winter Rose Hoskie. 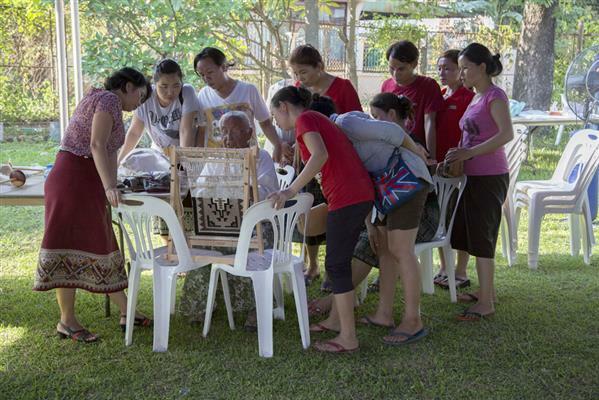 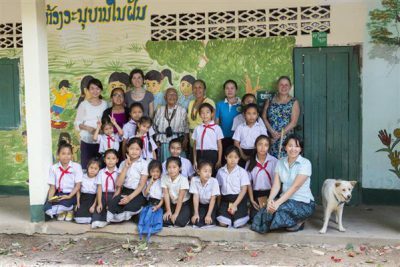 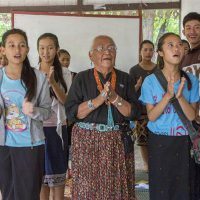 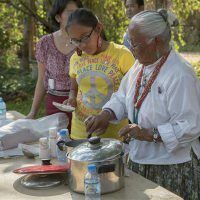 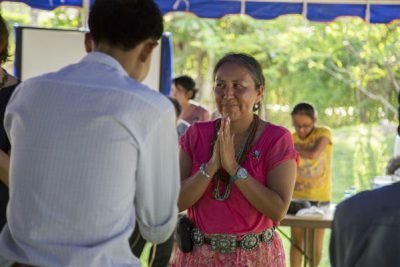 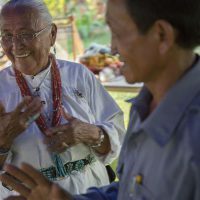 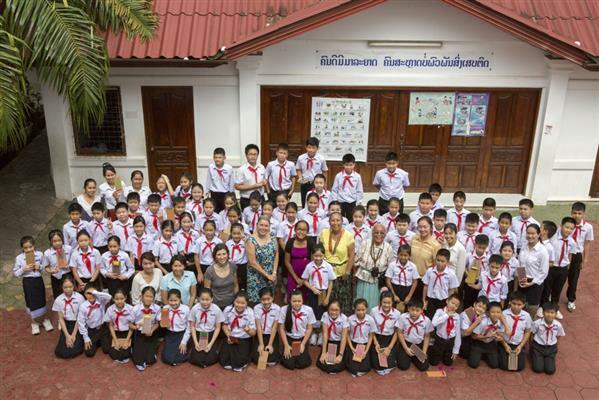 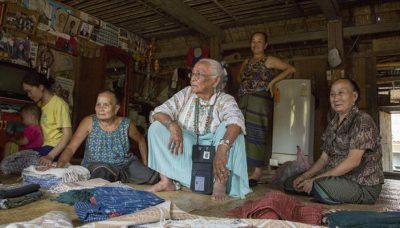 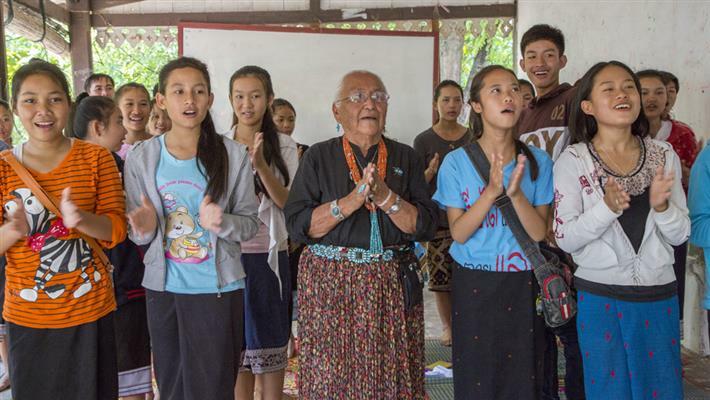 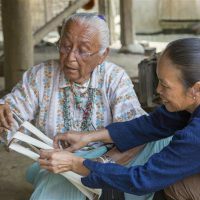 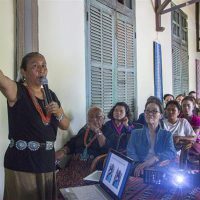 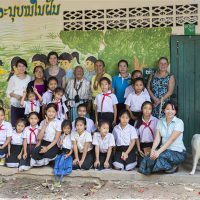 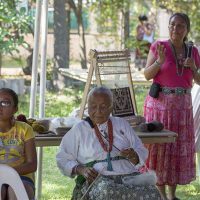 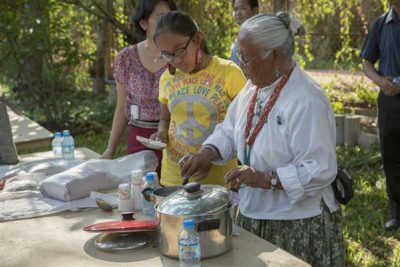 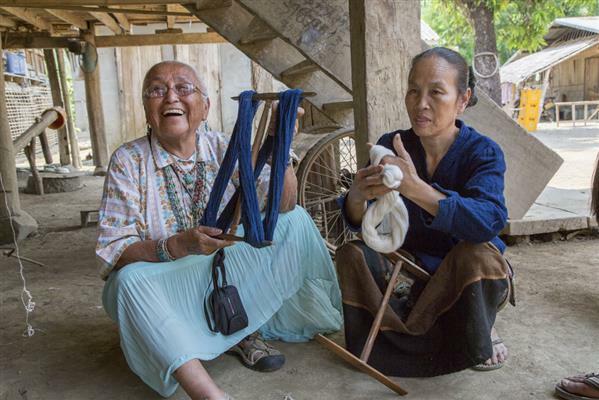 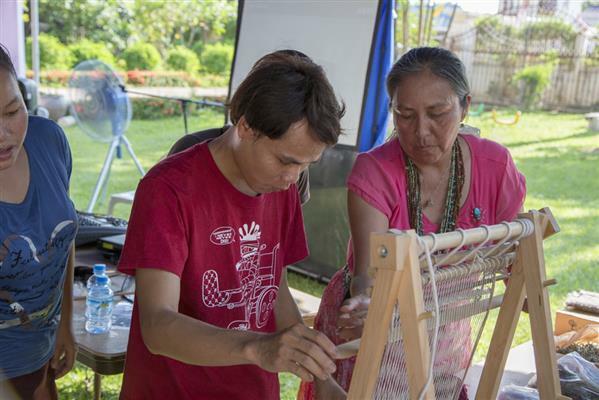 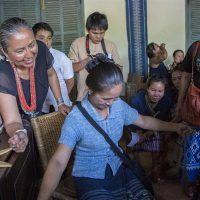 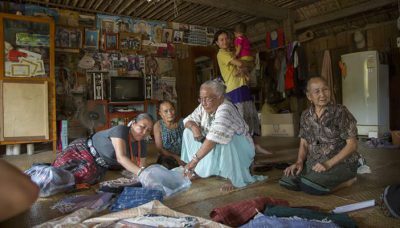 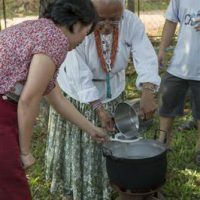 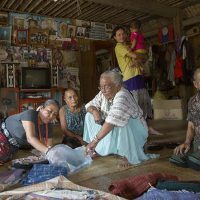 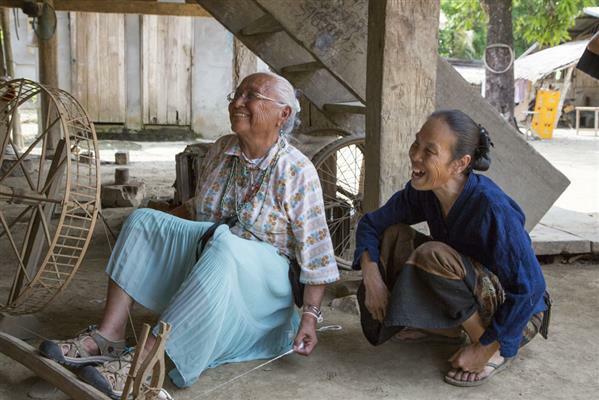 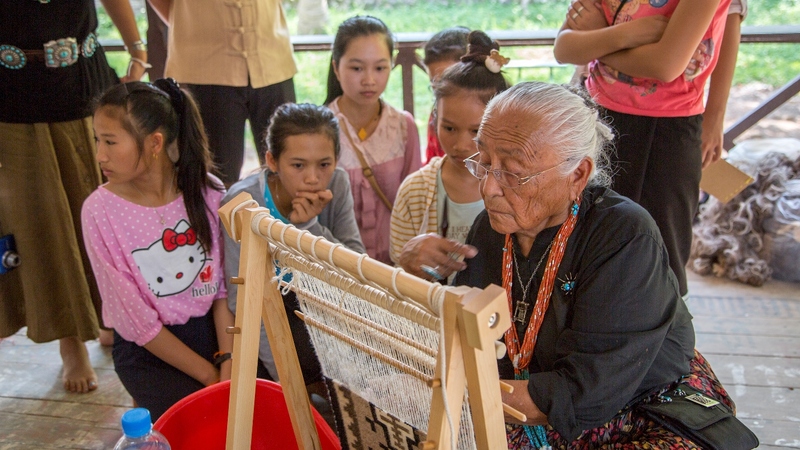 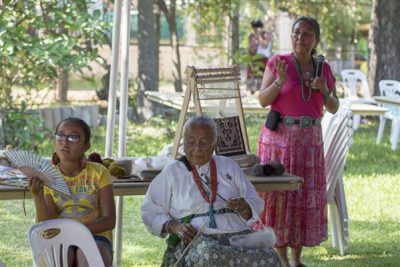 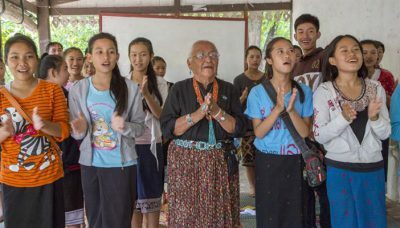 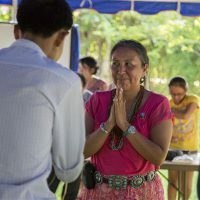 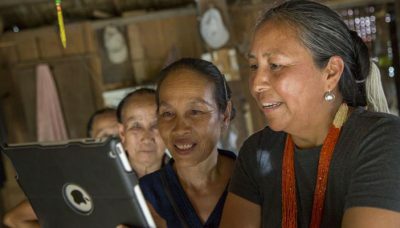 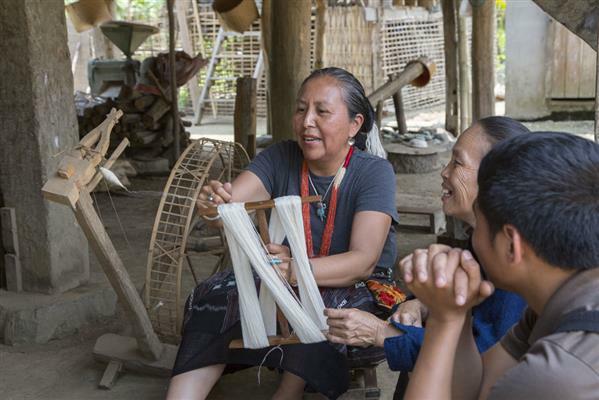 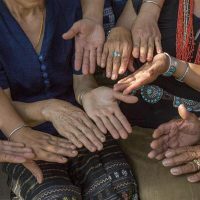 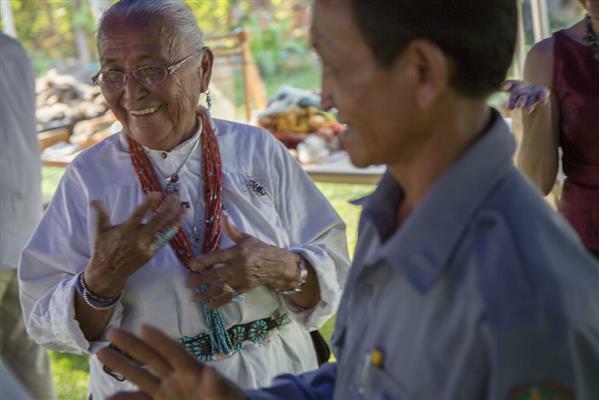 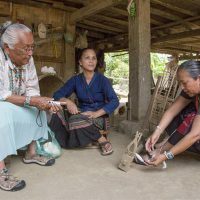 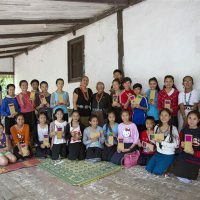 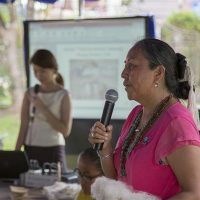 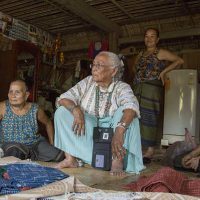 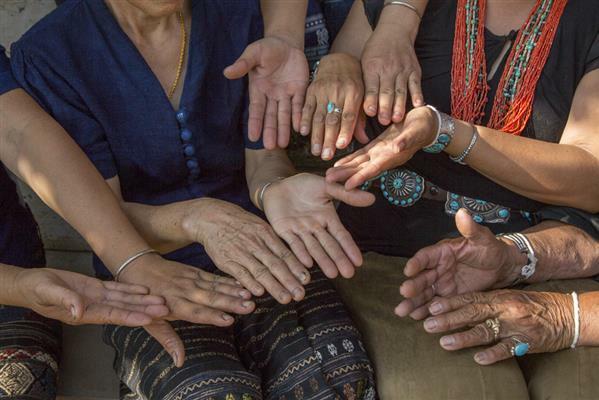 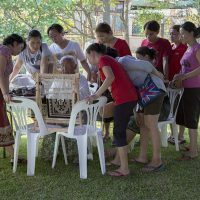 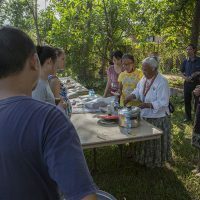 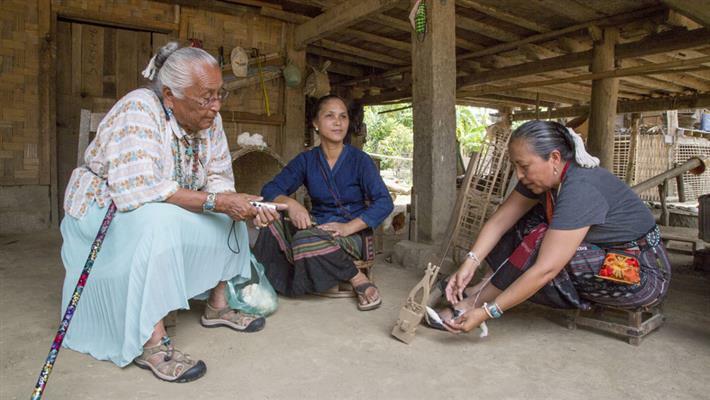 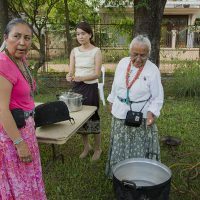 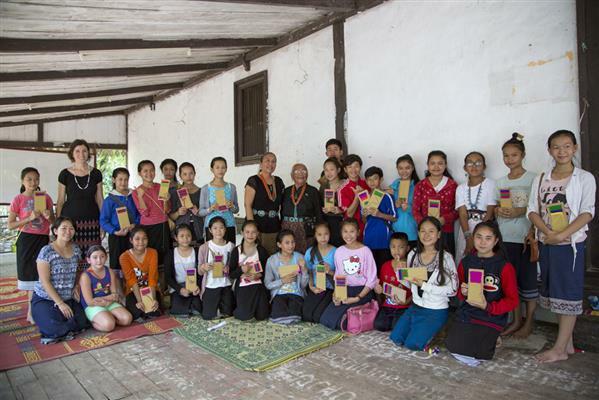 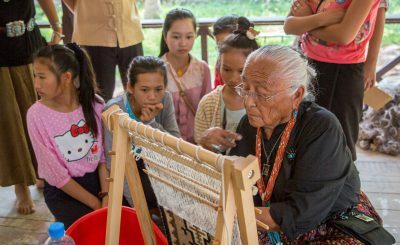 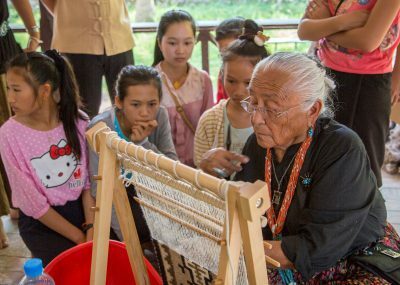 In May of 2014, this three generation family group of Navajo weavers traveled to Laos to meet and conduct cross-cultural exchange with Laotian weavers in three different parts of the country. 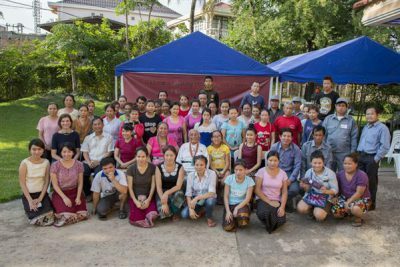 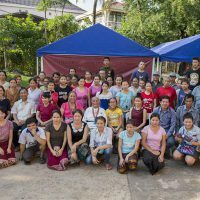 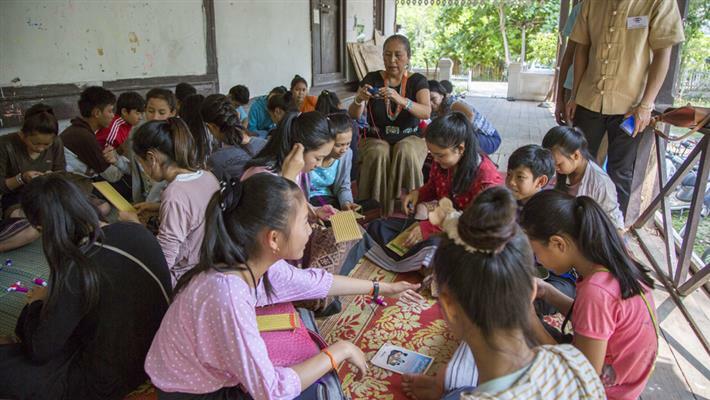 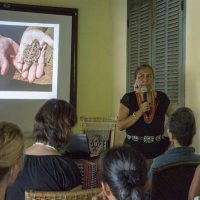 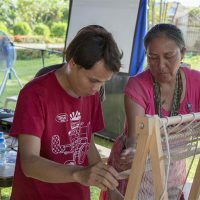 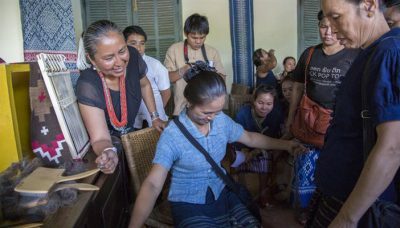 On the first day of the exchange, the weavers presented a workshop at Phaeng Mai Gallery in Vientiane, the capital of Laos. About 100 people attended the demonstrations on the traditional Navajo loom. 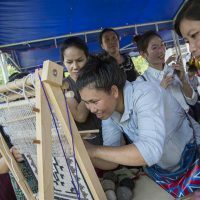 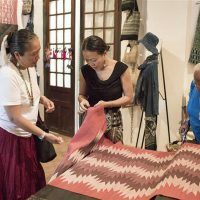 The second day included a visit to the Taykeo Gallery Weaving House, and a visit to Lao Textiles, where they were met by Carol Cassidy, the director and founder. 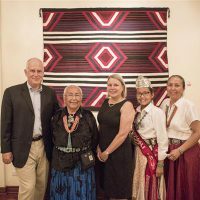 Later that evening Sarah, TahNibaa and Winter Rose were in attendance for the opening reception of the Art in Embassies exhibition, where three of their works, Classic Third Phase Shoulder Blanket, Mother Earth Shawl and Stripes, are currently on display. 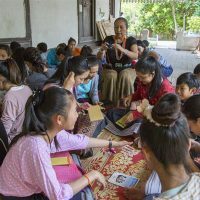 During their last day, the weavers facilitated two workshops at the Neerada Primary School and the Donekoi Children Development Center.